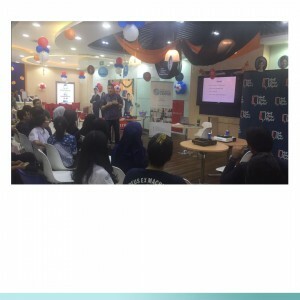 October, 20th 2017-As a regular speaker for Wallstreet Indonesia’s social club events, this month, International Wellbeing Center (IWC) delivered a 3 hours workshop about “Mindful Eating: How to Eat Joyfully Healthy”. Still with our spirit to raise awareness about practicing balanced diet for healthy living, our life coach Victor Larson opened the workshop by explaining the myth of eating healthy. We often hear that healthy living is costly and time-consuming. But it can actually be put into easy and effective practice as long as we have the will and commitment. The fresh fruits and vegetables can always be bought in the traditional market and grocery stores. The time to prepare the healthy home cooked meal can also be less. Victor continued the workshop by encouraging the audience to interview their friends about their food intake for that day. This to find out about people’s eating habit, in most cases not so healthy. A lot of Wallstreet students love to eat junk food because it’s easy and fast. However, when junk food is consumed very often, the excess fat, simple carbohydrates, and processed sugar contribute to an increased risk of obesity, cardiovascular disease, and many other chronic health conditions. Victor then put the audience into several groups to show them how to prepare easy and fast healthy meals just by using regular fruits, vegetables and ingredients that they can buy anywhere. He started the demonstration by preparing fruit smoothies for breakfast or snacking. He continued the demonstration on how to prepare healthy pasta for lunch or dinner. The cooking practice got a lot of enthusiasm from the audience as they also wanted to learn how to prepare simple healthy meals. Victor closed the workshop by choosing the group winners for making the best smoothies and pasta.